Spring cleaning can be an overwhelming task, it can also be a toxic one. So many of the conventional cleaners we use for spring cleaning contain harmful chemicals. No one wants a headache from fumes or possibly more serious side effects from spring cleaning. We clean in part to be healthier, right? If you have looked at eco-friendly cleaners you have likely seen many cost more than the conventional ones and no one wants to spend more money. And you don’t want to spend more time either. Thankfully, with some easy tips and tricks you can do your spring cleaning more naturally without increased cost or really any extra time. 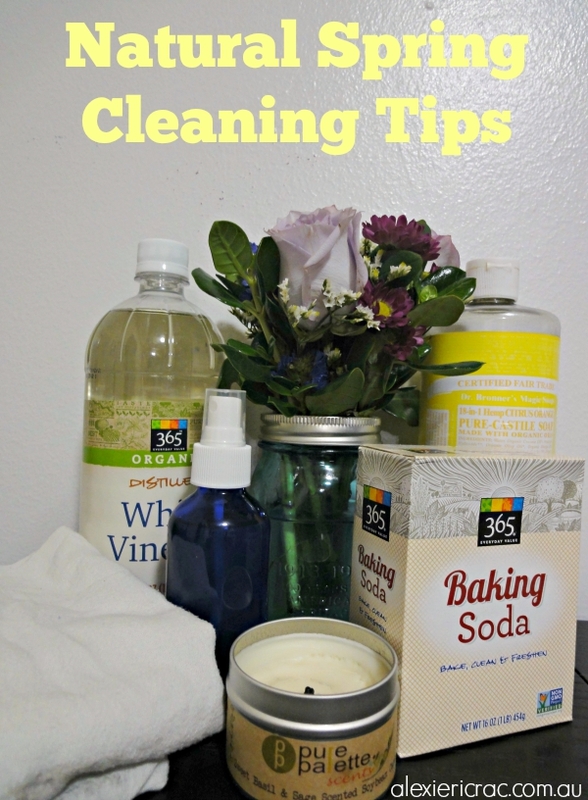 These are my tips for easy, natural spring cleaning. Use simple cleaners. Having a different cleaner for everything is overwhelming, expensive and who wants to carry all of that around? Simple hot soapy water works for a lot of cleaning. When cleaning my kitchen or bathroom I clean out the sink and fill it with hot soapy water. In the bathroom I use it for the countertops, bathtub, and sink. In the kitchen I use it for the countertops, to wipe down appliances, and to clean the sink. Basically anything you would use an all purpose spray for, hot soapy water can work.Vinegar and baking soda are the other two must-have cleaning products. However, don’t use them together as they neutralize each other making neither work. Baking soda is a great mild abrasive for tough jobs. I like to mix it with a bit of castile soap and water to make a scrub. I also like to use it to deodorize my carpet and clean my mattress. Vinegar is great for mineral buildup and disinfecting. I use it to clean my toilet and tile in my shower. Have a plan! If you just start blindly cleaning you may end up needing to repeat some steps or missing things. I like to use a simple checklist that has each room divided up. You can find a free printable by clicking this link. Work from the top down. When cleaning it’s best to always start on the top and work your way down because the dirt and dust may fall as you are cleaning. Don’t forget to clean the air. The air in our homes can get very dirty and not terribly fresh smelling after the winter. Airing out your home is a great way to reduce the indoor air pollution and leave your home smelling fresh. Keep it fresh. Speaking of making your home smell fresh, candles and other scented products often contain harmful ingredients that pollute the air you are breathing. Choose candles made with soy or vegetable wax and that use essential oils for the scent. You can also easily make your own air freshener with just a two simple ingredients. Reward yourself. When you are all done do something you enjoy and reward yourself for your hard work. Maybe buy a new piece of decor, fresh flowers, watch a movie and eat a yummy treat, whatever helps motivate you to finish. With these simple tips your home will be clean in no time and you will have done it all without harming the environment or your health! Be sure to share your spring cleaning tips in the comments. I’d love to hear your ideas! Lisa Sharp is a lifestyle blogger from the state of Oklahoma. 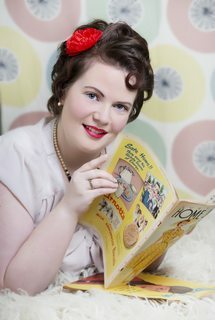 She blogs about homemaking, green living, and vintage lifestyle. You will find more green living tips, as well as other great content, on her blog. You can also follow her on Twitter, Pinterest, Facebook, or Instagram.